Users with permission may reactivate students who have submitted an online assessment for scoring in order to resume the testing session. Once reactivated, all existing scores will be erased from reports until the student submits the assessment for scoring again. Admin users may grant the Resume Online Testing permission to other Roles within the Admin module. 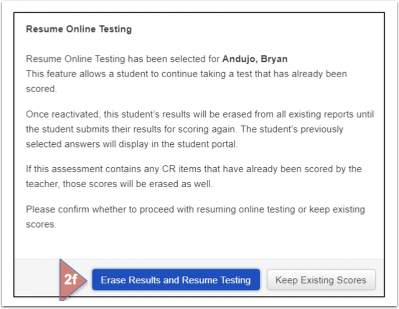 Admin Users may allow other users the ability to resume online testing for students who have submitted their test for scoring. 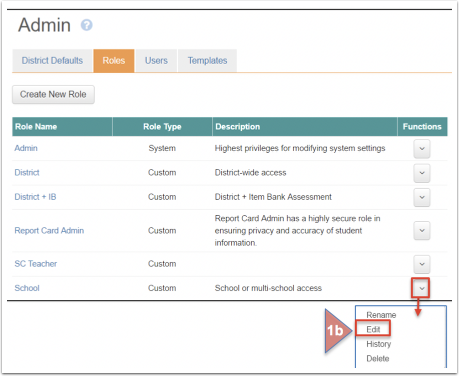 From the ADMIN Flip Card, select Roles on the flipped side. To the far right of the selected Role, click on Edit in the drop down menu. District Role: In the Assessment tab, find Resume Online Testing in the header. The District Role may be given permission to Resume Online Testing for District assessments (None, My, All). “None” means the user cannot resume online testing for any assessment. “My” means the user can only resume online testing for the assessments he/she has created. “All” means the user can resume online testing for all assessments. School Role: The School Role may be given permission to Resume Online Testing for None/My/All assessments at the School level and/or at the District level. Teacher Role: The Teacher Role has permission to Resume Online Testing for all Teacher created assessments as long as the View permission has been granted. The Teacher Role may be given permission to Resume Online Testing for School assessments (None,My,All) and/or District assessments (None, My, All). From the Top Menu Bar, select Assessments. Under Functions, click on the bolded Online Testing (computer monitor) icon. Find the Completed student (in green) to resume, and check the box to the left of the student’s name. Click on the bolded Activate (or Activate with PIN) button. A message will appear explaining the resume online testing feature. Click “Yes, erase results and resume testing”, or “No, keep existing scores”. On the Online Admin screen, the student will appear as Reactivated (purple). 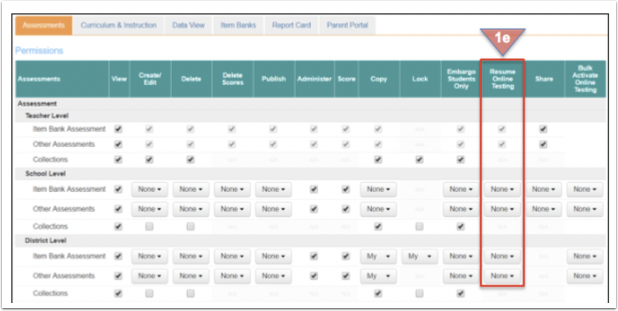 The student may now log into the Student Portal, select the assessment, continue testing, and submit it for scoring again.